Jackie Robinson (1919-72) was a true American hero whose reintegration of Major League Baseball (MLB) was a landmark moment in the struggle for African-American civil rights. To put his achievement in context, Robinson defied prevailing segregation patterns in 1947, a full seven years before the Brown v. the Board of Education decision declared segregated public education unconstitutional, eight years before Rosa Parks refused to move to the back of a Montgomery, Alabama bus, and seventeen years before the 1964 Civil Rights Act dismantled legal Jim Crow systems. In 1997, MLB retired Jackie Robinson’s jersey number 42 and, when Mariano Rivera retires after the 2013 season, no more MLB players will wear it. Does Jackie Robinson deserve a movie? You bet, but he deserves a better one than 42. 42 isn’t horrible–it’s Hollywood. That, of course, is often just a step or two above horrible, and seldom reaches higher than the lowest common denominator. Moreover, with the exception of boxing, few American sports are very convincing on the screen. In some respect, nearly all baseball films are a variant of The Natural, which is to say they are uniformed representations of what the late Joseph Campbell called “the hero’s journey.” In that cycle, an unlikely person–a black man in this case–receives a call to adventure, tries to refuse, is convinced not to by a mentor (Brooklyn Dodgers’ General Manager Branch Rickey), and then crosses the “threshold” from the “ordinary” to the “special” world. The hero is tested, bribed, and threatened before he undergoes a symbolic rebirth and embraces his special mission. In the end, he re-crosses the threshold and returns to the ordinary realm. 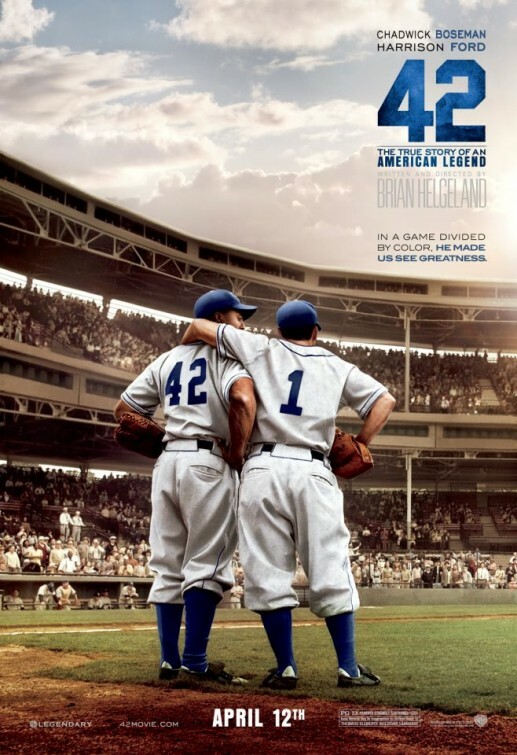 That’s the story arc in 42, though the bulk of the film centers on Robinson’s (Chadwick Boseman) relationship with Rickey (Harrison Ford), and how Jackie slowly wins the respect of skeptical and (in some cases) racist teammates during the 1947 MLB season. Because it’s Hollywood, numerous factual liberties are taken in the script (penned by director Helgeland). Boston Globe sportswriter Bob Ryan recently cataloged some of the film’s inaccuracies. These could be forgiven, if they had made the film more dramatic and enhanced our appreciation for Robinson. Alas, the film has a lightweight “Gee whiz!” feel, as if Robinson’s achievement was little more than a collective national task necessary to enhance American greatness. Nonsense! Robinson didn’t tread a teleological path; he thumbed his nose at convention and spat in the face of racism. We see the enormity of his accomplishment just once in the film–a scene in which Robinson is being brutally hectored by Phillies manager Ben Chapman (Alan Tudyk). There is name calling elsewhere and allusions of danger, but most of the film is so elegiac it could have been a joint project between Ron Howard and Ken Burns. Add Mark Isham’s cloying soundtrack, Nicole Beharie’s syrupy, puppy-dog eyed take on Rachel Robinson, and Dodger teammates undergoing racial conversion like so many Baptists at a river wash-me-down, and watching 42 is frequently like downing a bowl of Trix with extra sugar. Luckily, a few good performances save 42 from being a total disaster. Boseman is excellent as Robinson and strikes the right balance between gritty determination, smoldering anger, and inner vulnerability. The word “irascible” is often applied to Rickey and Harrison Ford does a credible job at being a gravely voiced, obstinate moralizer, even if he is a tad too folksy at times. Andre Holland does a fine turn as black sportswriter Wendell Phillips, the man who was Jackie’s road partner during his 1947 trial by fire. A lot of the minor characters are decent, though many of them seem to have been chosen because they look vaguely like someone more famous: Christopher Meloni’s Leo Durocher evokes John Sayles, Beharie looks like Meaghan Good, Holland is reminiscent of a younger Spike Lee, and Tudyk looks like a red-headed less beefy version of Curt Schilling. I won’t mince words–Eden Book 1 is an awkward, clunky book, even by the relatively low standards of pulp science fiction. First-time novelist David Holley comes from a background in advertising and graffiti art, both of which influence this book. Like advertising, Holley piggybacks on what is hot rather than substantive. He rides current waves of cynicism through his post-apocalyptic, dystopian setting, and gloms onto contemporary trends such as glamorizing soldier-warriors, engaging in disaster-of-the-day reporting, and sticking zombies into every narrative. Like graffiti art, much of Holley’s intent is internal and enigmatic for those living outside his vision. (Did you ever try to decipher a tagged wall?) For all of that, his book is a page-turner—more accurately a screen-flipper as it’s an e-book­–that one zips through. If you’re looking for a trashy, thrill-a-minute bit of beach reading, this one won’t tax your intellect. The year is 2022 and the United States has been wiped off the map, weakened by wars against Muslim terrorists, and then leveled by volcanic eruptions and tsunamis off the West Coat. Okay—we already have a problem. Holley simply states the devastation without explaining how ocean waters managed to traverse the Coastal Range, the Sierra Nevadas, and the Rockies! If tsunamis also formed on the Atlantic and caused seas to rise, why does Britain still exist? He needs to explain that because the major protagonists of his book are British, former Special Forces officer Noah Lockhart and his medical researcher wife, Evelyn. The set up is that the Muslim uprising has just been defeated, but it cost Noah most of his unit. 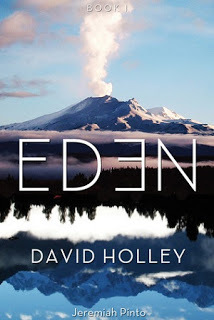 He is burnt out, resigns his commission, and decides to reconnect with Evelyn by taking a four-hour space shuttle flight to New Zealand for some much needed detox time. En route, the shuttle is sabotaged by an onboard terrorist and the shuttle breaks into sections and plummets to earth. The Lockharts are part of a small survivor group that manages to board rafts and make their way to some remote, uninhabited part of the South Island of New Zealand. All of Noah’s survival skills will be put to test as he tries to captain his intrepid band across mountains and ravines and through thick bush to civilization. Other major players include 18-year-old twins Max and Mia, and a Japanese couple, Hiroshi and Luna, whose daughter died in the shuttle’s impact. Did I mention that Mia is clairvoyant, or that Noah just happened to grab all manner of equipment, food, and spices (!) before the shuttle crashed? Good thing about the spices—just the sort of thing one needs when one is sautéing grubs. Noah’s backpack is the equivalent of Captain Kangaroo’s pockets—there always seems to be duct tape, a bit of rope, or some sustaining cashews at just the right moment.